The Bernaccian Britons were the descendants of the southern Votadini tribes. The state is mentioned in Old Welsh poetry, in the writings of Nennius, and elsewhere under the name of Bryneich or Brynaich. It is not quite clear whether this is simply supposed to represent a Welsh version of the later Anglian Bernicia, or was the name of a preceding Brythonic kingdom. However, as the name seems to derive from the Brythonic word Berniccā / 'berna', perhaps meaning 'gap' or 'land of mountain passes', the latter hypothesis would appear to be correct. It is possible that the name had its earliest origins in the Brigantes, although this is generally discounted. Calling upon either Corstopitum, just south of Hadrian's Wall, or Cataractonium (later Catreath of the Mabinogion, modern Catterick) as its capital, Bernaccia encompassed the land to the east of the Pennines, from the northern border of Ebrauc to the mass of the Lammermuir Hills which separated it from the northern Guotodin. Its traditional northern border stretched between Gefron (Yeavering, bordering the Cheviot Hills) across to the sea to the Din Guardi of Nennius (section 61 - see the feature link for the Historia Brittonum text). This fortress, Din Guardi or Dynguayth, is equated with Bamburgh thanks to an entry in the Anglo-Saxon Chronicle and also serves as the probable site of the Arthurian Joyous Gard. It lies midway between the two Roman walls but, considering the fact that the kings of Bernaccia were claimed as descendants of High King Coel Hen, who was also known as the 'King of Northern Britain', it seems likely that the remaining few miles of territory would also be claimed by them. Ynys Metcaut / Innis Metcaud (Isle of Winds) was the Celtic name for Lindisfarne. Much is uncertain about all of the kingdoms of the north (see the feature link), and the line of kings shown here is only able to be tied to Bernaccia through the last of them, Morgan Bulc, who was a key player in the ultimately doomed 'Confederation of British Kings' in the late sixth century. He is one of the 'Men of the North', but much of the North's traditions and tales were later transported to Wales, which is the only place in which they survived, and they were changed somewhat by the development of the Welsh tongue from the fifth century onwards. This explains why there are sometimes multiple versions of the same Bernaccian name, some Welsh (shown here first and known through the traditional Welsh sources) and some Romano-British (extrapolated or mentioned in isolation). Bernaccia is divided from the kingdom of Northern Britain which is controlled from the former Roman capital of the North, Eboracum. The new kingdom is created for Germanianus, a younger son of Coel Hen (almost certainly more readily known by his Latinised name which is not used in the later Welsh annals). His territory had formerly been the southern part of the Votadini tribal lands. Son of Coel Hen. 'King of Northern Britain'. Son. Apparently used by Nennius as High King Dunvallo Molmutius. It seems to be Dyfnwal Moelmud who is remembered in myth as the pre-Roman Conquest High King Dunvallo Molmutius. One of his sons, at least, also seems to be remembered as Brennius, and if the story regarding Brennius and his brother are based on real events then it seems likely that the two sons of Dyfnwal Moelmud inherit the kingdom, dividing it between them and perhaps coming into conflict. Geoffrey of Monmouth even links Belinus and Brennius directly to 'Northumbria', the later kingdom that encompasses Bernaccian territory, suggesting that he knows the true origin of the story. As Bran is sometimes also linked to Guotodin, it would seem likely that he holds the northern part of Bernaccia. Brother. In conflict with Cuncar? Also king of Guotodin. The apparent absence of Gawain of Guotodin from his kingdom either allows Bran Hen to take control of it, or the care of the kingdom is passed to him by Gawain. Morgan Bulc accedes to the kingship of a fully reunited Bernaccia, apparently at young age, when his childless uncle dies (or perhaps hands the kingdom to him from his own apparent base in Guotodin). 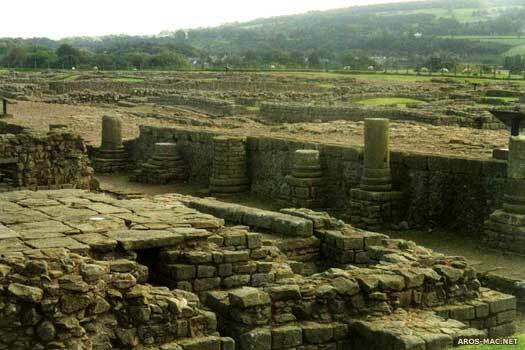 It seems plausible that it is at this time that Germanic warriors are settled along the coast or on Hadrian's Wall as laeti in order to strengthen the territory's external defences. The same thing had already happened in the region of Deywr. Bernaccia's laeti later claim descent from Benoc's Folk in Angeln. Son of Cuncar. High King? Dispossessed. Like the region of Deywr to the south, Bernaccia has its own group of Angles who have previously been settled in its territory as laeti, mercenaries hired to help protect the territory who are offered land in important locations. In this case, the Angles are led by Ida. They take control of the kingdom, forcing Morgan Bulc out of what becomes Bernicia. To the south, the kingdom of Ebrauc is still strong enough to lay claims to Catraeth. Morgan Bulc continues to claim the rule of Bernaccia from outside the kingdom, and fights on for many years. He appears to shift his power base to Guotodin, where he is mentioned as ruling after Gawain absents the kingdom. It is possible he also claims the title of High King. He is part of the 'Confederation of British Kings' of Elmet, Alt Clut and North Rheged which, in 590, lays siege to Ynys Metcaut. He is also credited with arranging the assassination of Urien Rheged, and defeating his son, so fatally weakening that kingdom and the British cause in the North.